The plan was to climb Benbulbin, a 525m high distinctive tabletop mountain overlooking Sligo but it proved difficult to find out any info on the best way which seems to be a hidden secret. Web forums talk of an approach from the north but also mention recent access issues with an irate farmer. To avoid any confrontation I chose an eastern approach. I found the waymarked Dooneens Bog Road, a good track which allowed a quick ascent to the plateau. In spite of a gravel track, it was a pleasant run out under the blue skies. But then the track ended. Just like that. The summit looked tantalisingly close but I could see 4 kilometres of bog trotting lay ahead. The Dooneens Bog Road was constructed by the Irish Land Commission to provide access to the plateau peat bogs for fuel when imports of oil and coal were restricted due to the Second World War although Ireland was neutral. The Land Commission was established in the 1880s to redistribute the lands of absentee landlords to their former tenants, provide fair rent control and security of tenure. 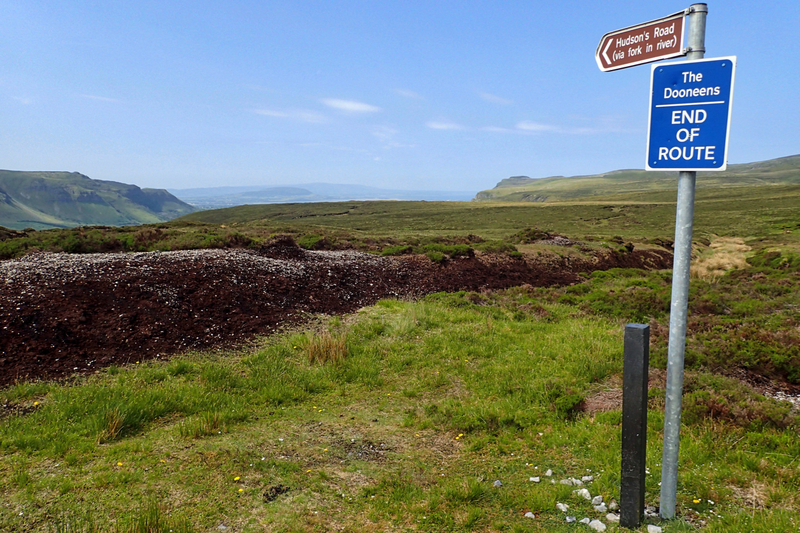 The peat bogs themselves are no longer cut on Benbulbin but elsewhere they are a recognised source of fuel. The attempt on the summit was abandoned leaving two choices: a backtrack or cut a loop off using Hudson’s Road which turned out to be a tad difficult to follow, not as well constructed.